Fluorescence Recovery After Photobleaching (FRAP) is a technique used to quantify diffusion. Generally a protein tagged with a fluorophore, such as a GFP-fusion protein, is bleached within a defined location through application of high power excitation light for a sustained period of time. Subsequent timelapse imaging is performed and the rate of recovery as well as the mobile fraction can be quantified. Reference areas which did not undergo bleaching are usually monitored as well to control for photobleaching that might occur during imaging of the recovery phase. 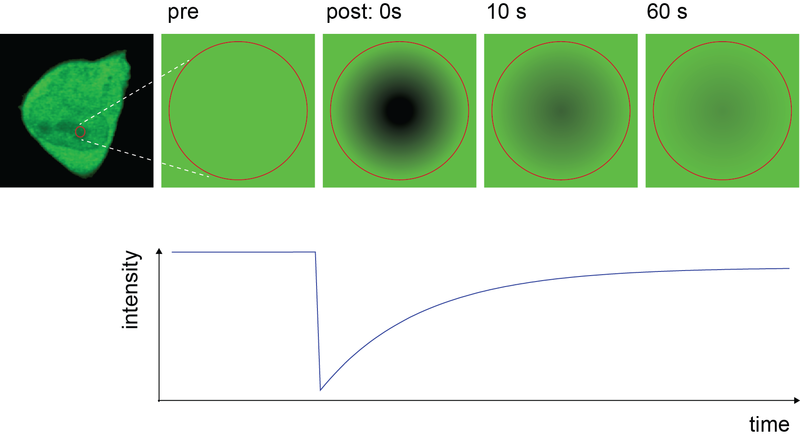 FRAP can be conducted on proteins diffusing in 2D, for example in the plane of the plasma membrane, or 3D, such as in the cytosol, and appropriate 2D or 3D diffusion coefficients can subsequently be determined.